What really caused this business and my local Appliance Repair Business was a $60 used dryer. I had owned a previous business that caused my wife and I a a serious financial strain. When we relocated, we needed appliances and all we could afford was used and cheap appliances. We found an old Kenmore washer that was in a yard and they were giving it away for free. Of course, we had to have a dryer. After searching for a few days. Someone recommended an elderly guy that sold used appliances and had a good reputation for standing behind his appliances if they did not work. After testing that $60 dryer at his small shop out back and it was working fine (running & heating). I purchased that dryer. The dryer worked 4 days! We exchanged 2 more dryers and they all ONLY worked 4 days! I knew the guy was in a financial & mental strain (he just told me his wife had Alzheimer's & his daughter had down syndrome... he was 72). I decided to call a local Appliance Repair Company to fix the dryer. He offered me a job (that I really needed at that time) and to train me (he had 40 years experienced). 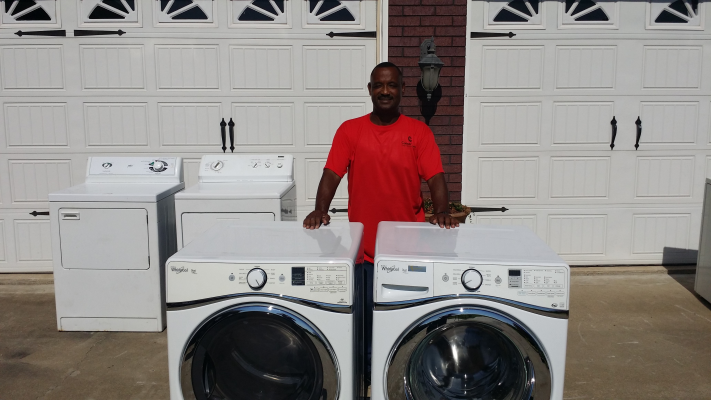 That was such a Blessing and My Local Appliance Repair Company was... Born!! 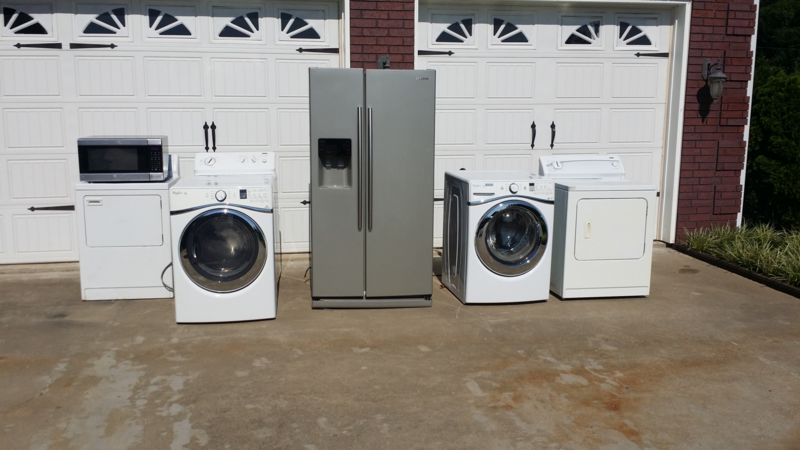 I talk to Customers everyday that are fed-up with spending $600 to $1200 for a Top Load washer & dryer or $2000 to $3000 for the Front Load Set and then have to repair them in 2 to 4 years on average. I purchased this set of Whirlpool front load washer & dryer set for $100 ($50 each). I will need to put a few bucks in them and sell them easily for $1000 to $1500. Everyone has Appliances and as most of You already know (just by the appliances you have) they are always breaking or need repairs. With the Economy & the Job Market being what it is... Everyone is trying to Save Money anywhere they can and Used Appliances is Definitely One of Them! Hey Guys, I'm Chris. I have been repairing, servicing and selling appliances for over 12 years... and I love it. If you have thought about owning a small business or being your own boss... this is it! Appliance are super easy to sell. Everyone is trying to save a buck now a days. All they want is a fairly good looking appliance in decent shape. Because washers, dryer, refrigerators are a must have in every household. You want have ANY problem selling them. What is it worth? Most people have NO idea what an appliance is worth when it doesn't work. Most of the time it is a simple repair, we live in a "I want it now" generation and they will place it on the lawn or call someone to pick it up (that should be you, I will show you how). Competition is NO problem. Most people don't want to deal with moving appliances or don't have the means (truck, dolly, tools). That just means that the opportunity for you to get those appliances free or cheap are much greater. Cleaning & Painting - How to clean & paint the appliances. The phrase "a picture is worth a thousand words" is definitely true with appliances... the better they look, the more you make! Growing Your Business - How to grow your appliance business... the right way! Customer Service is #1. When done right they will help you grow your business beyond your wildest dreams. Appliance Parts - Where to find discount parts, get the parts you need at wholesale prices. This is the most important element of the Sell Used Appliance Business. Without the Supply of Appliances, you want have a successful business. And NOT just any supply! You don't want to be a junk collector. You want quality, cheap, low repair & free appliances. We have created a form and a website (if you need one), that will have people calling you to pickup their appliance(s). I cannot count the number of appliances that I have gotten for free because it needed a part that cost $6 and I sold the appliance for $125 - $175. I cannot begin to tell you if you do this business the right way. You will NOT be able to get the appliances fast enough and you will have a waiting list of customers waiting for your appliances before you get them. Everyone is trying to save money any way that they can. They will search websites like; Craigslist, LetGo,etc. to save hundreds of dollars. Their mindset is why spend $500 to $1500 for a washing machine, that you can get for $200 - $300 or less. Why pay $800 to $1000 for a stove, that you can buy for $225 - $275? They know that Craigslist & LetGo has great deals for appliances and YOU want to have your appliances listed on these site. You want to find appliances that will make you a "Pure Profit" of $100 to $200 or more. Pure Profit is after parts and cost (if you paid for the appliance). Don't forget you want the highest quality appliances for the lowest price. They sell so much faster and for a lot more money. And when you can sell them as a set (even if they don't match exactly), your profit will go thru the roof!! How Do You Get the BIG $$$ for Your Appliances? When you find a good deal. Don't procrastinate when there are good deals to be had. When someone call you or you hear of a good deal, stop what you are doing or send someone to take a look at the appliance and buy it if it is a good deal. If you have to pick it up later... that's fine. How do you know what a good deal is? It's in our course. Clean Appliances sell like "hot cakes"! Think about it like this. Would you buy a dirty smelly car? Of course not! Also, when you clean your appliances you will get a much higher price for them. And your reputation for clean appliances will grow your business much, much faster. It doesn't take much to clean an appliance. We will show you how in the course. If your Sell Used Appliance Business is going to be a success and provide the most profit. You will need to know how to repair/fix the appliances... yourself! If you have to pay someone to repair the appliances, you are losing a LARGE percentage of your profit. Also, when you have to depend on a repairman showing up when he/she is suppose to. You will lose sales as well. People that need an appliance will NOT wait until you get your appliances repaired. They will buy from whoever has one clean and ready to sell. Our course will provide you with all the training you need. We teach you what brands and models of appliances that are the most reliable, least problems and sell fast. You should NEVER sell an appliance that you would not own yourself or that you know will cause major problems in a very short period of time. Remember this is NOT just about making money, it's about providing quality appliances and growing your business with integrity. Vehicle capable of moving appliances - truck or van. If you don't have one borrow one from a relative until you can afford to get one. If you have to, rent one on the days you need it. Hand Truck or Dolly - This is a must. Again, if you need to borrow one when you first get started that's fine. You should be able to buy one soon. I have one now that is "worth it's weight in gold". It has the strap that will keep you from dropping the appliance, you can go up and down stairs with it. It is a one man appliance moving machine. You will see it in the course. Pays for itself a thousand times. Tie Down Straps - This is needed to secure the appliance to the truck or van and to keep from damaging the appliance in transport. You don't need to buy anything expensive. Purchase them from Walmart. Don't start out investing in high end tools or equipment. As the business grows use that money to purchase the upgrade tools and equipment that you desire. Is This a Good Business to Start? Yes, this is a very good business to start. I believe anyone can do this business with the right attitude, motivation, drive and mentor. However, as with any business when you first start, there will some challenges. But, they don't outweigh the enjoyment that comes with being your own boss, making your own hours, quality of life, unlimited income potential, possibly leaving a legacy for your children and building something you can be proud of. If you are interested in starting a Sell Used Appliance Business full time or part time... we can help. I created this course and membership to help as many people as possible to Start their Own Business. You can start this business or you may find you like the Appliance Industry and want o Start Your Own Appliance Repair Company. Whatever you choose we can help. The Appliance Industry is an awesome trade to learn and one of the most import aspects... it works anywhere! As you know every household as appliances... every city, state and country.